Monday is my 34th birthday. I probably won’t have many more. A year ago, I was healthy. That is, until I was diagnosed with ALS — also called Lou Gehrig’s disease. It’s a rapidly progressing deadly ailment with no cure. Now, I walk with a cane, I have trouble breathing, and I don’t even have the strength to lift my 18-month-old son into my lap. Some days I feel like giving up. But I can’t. I’ve been crisscrossing the country fighting the Republican tax bill — and fighting for my life. The Republican tax plan would mean serious cuts to disability funding that I’ll need before too long to pay for a ventilator to keep me alive and other crucial medical care. 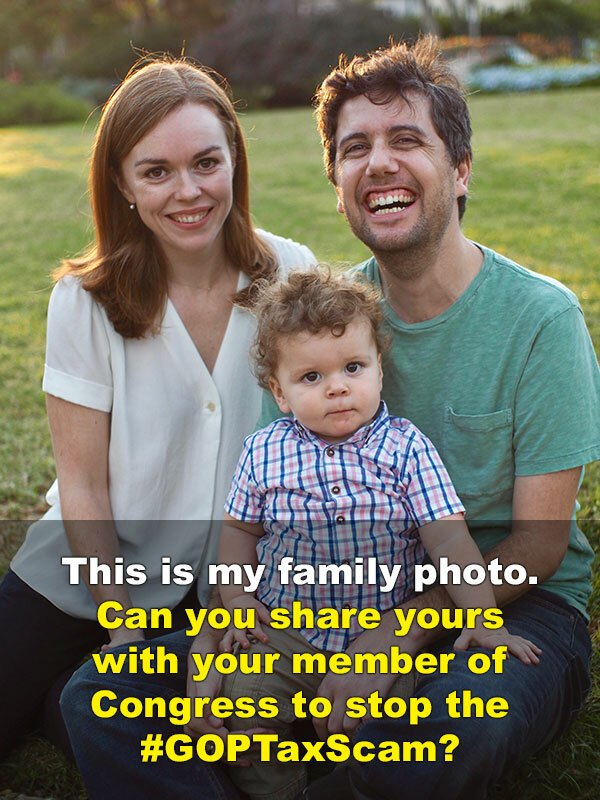 What will these Republicans in Congress say to my son if I can’t get one? My birthday is Monday and I have one wish. I want us to make it a massive day of action to kill the Republican tax scam. Will you join me in D.C. on my birthday Monday for a rally to kill the Republican tax scam? RSVP here. Last week, I flew from my home in California to Washington DC to get arrested protesting the Republican tax bill. On my flight home, I met Senator Jeff Flake and had a discussion with him at 30,000 feet. I asked him to be a hero and kill the tax bill. The video of our conversation went viral on Twitter and then made the national news. This week, I came back to DC again, meeting with Senators Flake and Collins — two of the key swing votes — and I gave them a photo of my family to hold on to. Because so much is on the line for me, they couldn’t turn away — they had to actually sit and listen. Some days every breath is a challenge. But what choice do I have? I keep fighting. And I hope you’ll keep fighting with me. Join me in D.C. on my birthday Monday to kill the Republican tax scam. Click here to call voters in key states to help defeat the Republican tax scam. The disease I suffer from will probably kill me. There’s nothing Congress can do to stop that. But the Republican tax plan will make it worse, and it could cost me precious years with my son. It will peel away medical support just when I need it most, and pull money away from research into serious diseases. All to give the richest people who ever lived another massive tax cut. It’s a disgrace. I hope you’ll stand with me — it means a lot.